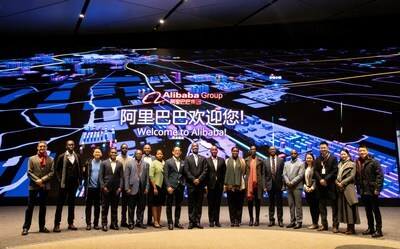 HANGZHOU, China, Jan. 14, 2019 /PRNewswire/ — This week, delegates from the government of Rwanda completed the first New Economy Workshop held at Alibaba Group’s headquarters in Hangzhou. During the four-day workshop, twelve government leaders met with Alibaba executives across multiple businesses to learn about the transformative impact and promise of a new digital economy as well as how to drive economic growth by accelerating digital finance, logistics, e-commerce and big data industries. The New Economy Workshop program aims to empower participants to use their knowledge to continue supporting the development of Rwanda’s digital economy. Participants included the CEO of Rwanda’s National Agricultural Export Development Board (NAEB), the Rwandan Ambassador to China and representatives from the Ministry of Trade and Industry (MINICOM), Higher Education Council (HEC), Rwanda Utility Regulatory Authority (RURA), Rwanda Information Society Authority (RISA), Rwanda Development Board (RDB), Rwanda Energy Group (REG), and the Ministry of ICT & Innovation (MINICT). The workshop follows the launch of the first African eWTP (electronic world trade platform) hub in Rwanda witnessed by President Kagame and Alibaba Group Executive Chairman Jack Ma last October. Under the eWTP agreement, the government of Rwanda and Alibaba committed to work together to strengthen the country’s economic development by promoting policy innovation and providing capacity building to empower the growth of Rwanda’s digital economy. “At Alibaba we have seen first-hand the transformative impact digital technology can have in building an inclusive society. This New Economy Workshop is meant to not only provide capacity building to Rwanda’s policy makers, but also to inspire them to become advocates for Rwanda’s digital transformation and for the country’s technology entrepreneurs,” said Angel Zhao, President of Alibaba’s Globalization Leadership Group. In October 2018, the first African eWTP (electronic world trade platform) hub was launched in Rwanda. Through this partnership, Rwanda and Alibaba work together to enable cross-border trade of Rwandan products to Chinese consumers and facilitate China outbound tourism to Rwanda. In August 2018, fifty lecturers from Rwanda’s top universities attended the first Global E-commerce Talent (GET) Program organized in partnership with the Ministry of Education’s Higher Education Council and the Rwandan Development Board. GET is a five-day course to boost the competencies of Rwandan university teachers and deepen their understanding of the e-commerce industry, so they can train future entrepreneurs. In partnership with UNCTAD, Alibaba Business School is training 1,000 entrepreneurs from emerging markets over five years. Two hundred of those entrepreneurs will come from Africa. Five Rwandan entrepreneurs have already graduated from the eFounders Fellowship program. As part of eWTP collaboration, Alibaba Business School will host the first Alibaba Netpreneur Training program from March 2-13, 2019 for approximately 40 entrepreneurs contributing to digital transformation, who are currently operating in the Rwandan market, or are in the process of expanding to the Rwandan market. For those interested in participating, visit this page for more information and to apply now. Applications are open until January 20, 2019. Alibaba Group’s mission is to make it easy to do business anywhere, and the company aims to achieve sustainable growth for 102 years. For the fiscal year ended 31 March 2018, the company reported revenues of USD 39.9 billion. For more information, visit Alibaba’s corporate news site Alizila.com.